Type – Hard coded with ‘Payment. Vendor – If done from inside AP for an existing vendor, this will be the vendors code and it is not editable. 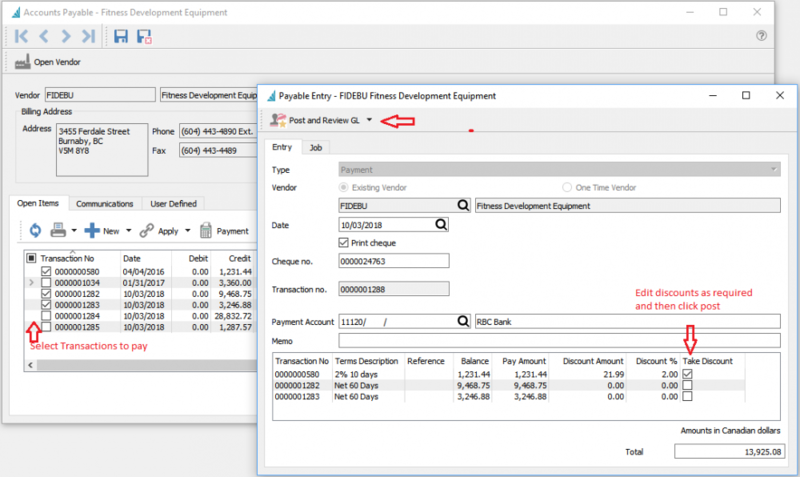 Print Check – Each vendor has a field for if a printed check is used for them, however the user can override this. If selected, a check will be printed using the check number displayed. *Note that check number can be edited just before posting. Then the next check will automatically advance to the one after the edited number. Payment Account – Select the back account for this payment. Uses the default account set in Company Settings/Special Accounts. Transaction Number – The GL transaction number from the amount of the AP transaction. Take Discount – Check to give the discount. Amounts that fall within terms will automatically be checked but user can override.